At the age of 17, Chelsey and Emily Cornwall were high school students, triathletes, and names on a heart transplant list. The identical twins had a progressive heart condition called arrhythmogenic right ventricular dysplasia (ARVD). It's an often-inherited disease of the heart muscle that can lead the heart to beat irregularly, weaken, and ultimately fail. Doctors projected the sisters had two, maybe three years to live. But Chelsey and Emily never stopped believing they'd survive. And now, they credit their health journey with leading them to where they are today – sales representatives in Abbott's Cardiac Rhythm Management (CRM) business in Reno, Nevada, USA since 2013. "We can't imagine doing anything else," said Chelsey. "Had we not been through these experiences we wouldn't be doing this right now. And we're going to do this as long as we can." Chelsey and Emily grew up in Reno. They were competitive athletes. 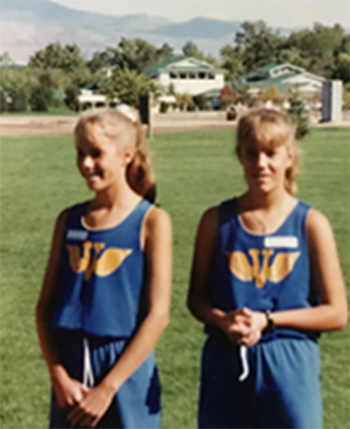 So it was strange, when a then 17-year-old Chelsey woke up one morning with swollen legs and had to cut her daily run short because she was too tired to finish. A number of medical tests later, doctors found the problem. "Your heart is failing," a physician told Chelsey. The initial diagnosis was that a virus likely weakened Chelsey's heart. But when Chelsey's identical twin sister, Emily, received cardiac tests a month later for a "huge thumping feeling" in her chest, doctors realized the problem was worse than they'd thought. Emily's heart looked just like Chelsey's – the muscle on the right side (which pumps blood to the lungs) had been replaced by fat and scar tissue. The diagnosis was ARVD, which also goes by the name arrhythmogenic right ventricular cardiomyopathy or ARVC. This condition accounts for about 12 percent of sudden cardiac deaths among young U.S. athletes, and death often is the first symptom, according to a 2013 literature review in Clinical Medicine Insights: Cardiology. To help resolve the problem, the sisters got defibrillators implanted on the same day. The device is inserted in the chest and delivers a shock to the heart when it senses a dangerously fast rhythm. "We thought that would be the end of our problems, along with having to ease up on our workouts," Chelsey said. But Chelsey's heart continued to weaken, leaving her with one option – a heart transplant. So, her name was added to the national heart transplant waiting list. Today, that list is nearly 4,000 people long, according to the United Network for Organ Sharing, the non-profit organization that manages the organ transplant system in the U.S. While waiting for a heart, some people use Abbott's HeartMate 3 system, a small, implantable heart pump that improves patients' survival and lowers their risk of blood clots and stroke. However, neither Chelsey nor Emily were candidates for our heart pump because their heart failure was on the right side and HeartMate systems are for left side failure only. So, Chelsey started college with Emily, at the University of Nevada, Reno, with a pager in her pocket to alert her when a heart became available. "Emily and I always believed, 'If it's my time, it's my time,'" Chelsey said. "We wanted to go to school and do the things we loved. We felt like, 'If my time runs out before I get a heart, then at least I lived my life.'" At college, Emily studied marketing and Chelsey focused on biology, with hopes of becoming a doctor and helping the sick get well. Chelsey's chance at health came on May 23, 2001, when she received her first heart transplant. She was 19. And a year later, on June 4, 2002, Emily received a new heart. Both transplants were successful. 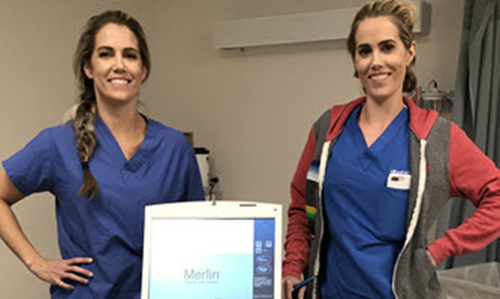 The sisters finished college and Chelsey, deciding life was too short to spend studying in medical school, became a Cardiac Rhythm Management (CRM) representative at a medical device company that joined Abbott through the 2017 acquisition of St. Jude Medical. And Emily did too. Six years after receiving her heart, Chelsey began passing out. She went into cardiac arrest at an airport and was in a coma for a week. 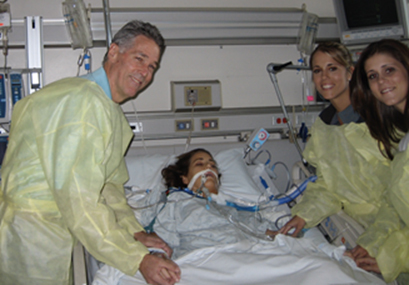 That led to her second heart transplant on April 12, 2007 (shown recovering in photo below). Chelsey was 25. Although Emily hasn't needed a second transplant, she's had two cardiac ablations since receiving her new heart. Cardiac ablation is a procedure that helps correct heart rhythm problems by scarring or destroying tissue in the heart that triggers an abnormal heart rhythm. Chelsey and Emily's experiences have helped them form special bonds with their Abbott patients. "There's no question that our heart condition led us to become CRM reps," Emily said. "When we had our defibrillators, reps came to check on our devices and we were intrigued by that as a job." "We see this job as a way to give back," Emily added. "It's a way to use our difficult experiences to help people." "We can relate to all of our patients," Chelsey said (in photo on the left, at work with her sister). "Whether they're having a device or stents put in, or an ablation, or open-heart surgery, we've been through all of it." But they don't share their story with everyone. They hold on to it for the patients who they can tell really need help and hope. In fact, doctors often call the sisters and ask them to speak with patients who are having a tough time with a recent cardiac diagnosis or an upcoming procedure. "When we talk to patients, especially the younger ones, about what we've been through, you can tell it makes a difference," Emily said. "It's like they suddenly have this hope, that it's going to be OK."
Emily's wedding photo is courtesy of Rachel Rose Photography.